Bath bombs seem to be the new thing! With a variety of scents people are going crazy! Everyone loves sitting and relaxing in a bath after a long day. We are here to make that easier. 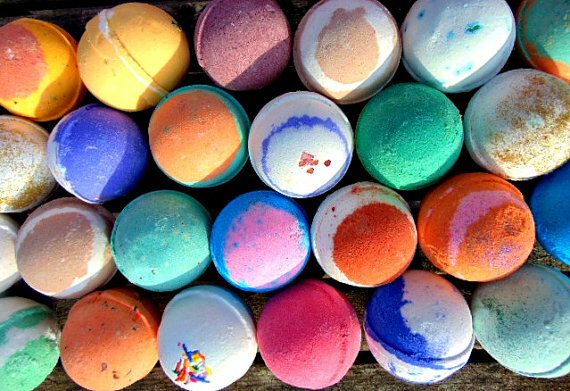 Instead of going to buy bath bombs, why don’t you just make them at home? You can make whatever scent you want with the recipe we have listed below! Sift 1 3/4 cup baking soda, 1 cup citric acid, and 2 cups cornstarch through a sieve to remove chunks. To make different tints, fill small spritzer bottles with water and add about 6 drops of food coloring to each. Pour 1 cup of powdered mixture into a glass bowl. Lightly spritz, stirring after each spritz, until powder is desired color. Add water slowly, so mixture does not fizz. If mixing two tints, alternate colors as you spritz. Check the consistency of powder with your fingers; when it can be tightly packed or shaped, stop spritzing (this may take a little while). Select an essential oil. Add 5 drops if it's one of the stronger scents (peppermint, lavender), 6 if it's a weaker one (lemon, grapefruit). Mix well. Firmly pack mixture into small baking molds. We used 1/4 cup for each fizzy, which is good for one bath. Allow mixture to set for 2 hours, and then pop out carefully. Repeat with different tints for remaining powder. Post a picture to our page of you making your bath bombs!